The difference between merely getting by and making a large fortune in your business is largely dependent upon your keen awareness of a few key strategies and actions that your competitors don’t recognize or can’t act on. Take maximum advantage of the hidden opportunities, assets, and advantages you possess NOW, the advantages that all super-successful people capitalize on as a matter of principle. When you've got things clicking, there's no limit to what you and your business can do. MasterMind Marketing: Money-making power principles for your business success! The difference between merely getting by and making a large fortune in business is totally dependent upon a few key MasterMind Marketing strategies and actions that you take that your competitors don't recognize or act on! 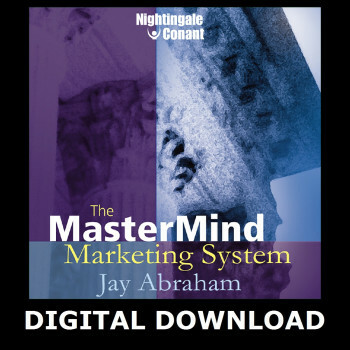 Jay Abraham's The MasterMind Marketing System shows you how to take maximum advantage of the hidden opportunities, assets, and advantages you possess NOW, the advantages that all super-successful people capitalize on as a matter of principle. You will discover a kaleidoscopic array of possibilities you can implement immediately to exponentially increase your success, income, and opportunity base. Jay Abraham uses time-tested strategies in a unique layered approach that will free you from business worries as they iron-clad your future success. Hundreds of people have become millionaires or multimillionaires by following Jay Abraham's advice. Thousands of people have doubled, tripled, and even quadrupled their sales or income. The secret they know is this: 98 out of 100 people use tunnel vision in their own business endeavors, never looking beyond the traditional ways of doing business in their own field. Through Jay Abraham's experience in over 400 different industries, you will expand your view of what is possible and learn a myriad of ways to keep your customers coming back for your product or service permanently. You will discover how to bring a customer into your sphere of influence and never let him or her go, with strategies to optimize each business relationship. You will learn how to see opportunities differently than you have before, to remove obstacles and view things from a non-myopic standpoint. You will uncover the small distractions and adjustments you can easily make to them increase your business, not laterally, but exponentially.